Kassiani is one of the first composers whose scores are both extant and able to be interpreted by modern scholars and musicians. Approximately fifty of her hymns are extant and twenty-three are included in the Orthodox Church liturgical books. The exact number is difficult to assess, as many hymns are ascribed to different authors in different manuscripts and are often identified as anonymous. In addition, some 789 of her non-liturgical verses survive. Many are epigrams or aphorisms called "gnomic verse." An example: "I hate the rich man moaning as if he were poor." She wrote many hymns for liturgies; the most famous being the eponymous Hymn of Kassiani, sung every Holy and Great Wednesday (liturgically; actually chanted late in the evening of Holy and Great Tuesday). Of course, it is not Kassiani the nun who is "the woman who had fallen into many sins", as some thought. She is though, the poet who is anguished as she witnesses the fall of mankind. This anguish however, does not lead her to a pointless cursing of the 'fate' of humanity. She climbs onto the wings of Faith, and harbors in God's love, in order to present, with a unique sensitivity, the human pain that will eventually be healed and lead to the unending doxology of the "soul-saving Lord." 'The woman who had fallen into many sins', the heroine of the drama which Kassiani presents to us, concludes her prayerful monologue. 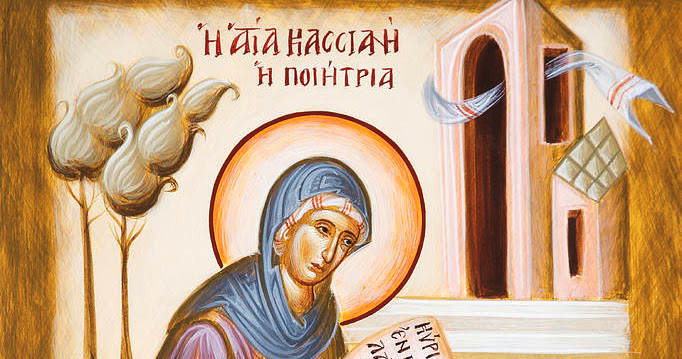 She proclaims in a way which matches the overall tone-humble, supplicatory, modest-her basic request, which is also the message of the hymn--she expresses it with prayer in a tone of unshakeable faith and certainty: "Do not disregard me…You, whose mercy is boundless."